Irish christening tradition is much like other Catholic christening traditions. The Irish are, after all, predominantly Catholic...and the formal christening ritual is primarily practiced in the modern Catholic faith. But there are definitely ways to incorporate certain Irish customs and superstitions into your baby's christening. You can also honor your baby's heritage by using a variety of distinctively Irish symbols and recipes in everything from the attire and gifts to the decorations and food at the Irish christening reception after the ceremony! One of the best ways to honor your baby's Irish heritage would be to say an Irish prayer during the ceremony. A prayer to the patron saint of newborn babies, St. Brigid would be especially symbolic. Being such a profoundly spiritual event, and the Irish being such sentimental folk, it's also popular to give a religious gift to mark the occasion. Giving an emblem of your family's faith can be your way of asking God's blessing on your child...day and night. 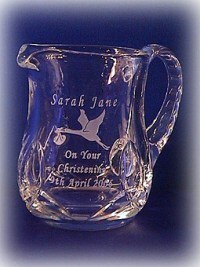 One such gift would be the personalized Irish crystal christening mug shown on the right. The trinity knots cut into the sides of the mug represent the blessed Trinity... Father, Son, and Holy Ghost. These are the words the priest says as he pours holy water over the child's forehead at the Christening. Perhaps you could give your baby a bible or blanket embroidered with a Celtic cross or other Irish symbols, like the Claddagh or shamrocks. Another way to make it a distinctively Irish christening gift would be to have the bible or blanket embroidered with Celtic knotwork. Another spiritual Irish christening gift would be an old Irish blessing. 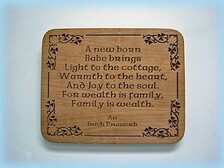 The handcrafted plaque on the right features an old Irish proverb beautifully carved in cherry wood. It reads, "A new born Babe brings Light to the cottage, Warmth to the heart, And Joy to the soul. For wealth is family, Family is wealth". What a comfort it will be to see it securely hanging right by your baby's bed as she sleeps...as you say your bedtime prayers, asking for God's blessings on your child. Another Irish christening tradition is part of Irish wedding tradition as well. A superstitious Irish bride customarily carries a Magic Hanky on her wedding day, and has it converted into a bonnet for her firstborn to wear to the christening. The, when it's time for her firstborn child to marry, she converts the bonnet back into a handkerchief for the new bride. The traditional Irish wedding cake is an Irish Whiskey Cake, which is very sweet and very rich. It is customarily thought of as a "fertility" cake, which will help the newlyweds to quickly start a family. After the wedding night, the couple saves the top tier of their wedding cake until the christening of their first child (which in the early days was usually within a year of their marriage). At the Irish christening reception, the new parents serve the cake and sprinkle crumbs on their baby's head as a symbolic wish for a long and prosperous life for the newest addition to the family. According to Bridget Haggerty's book, The Traditional Irish Wedding , it's customary to save a bottle of champagne from your wedding to open at the reception of your firstborn's christening...using it to "wet the baby's head". long Life, Love, and Prosperity..
Another Irish christening custom is to give your baby his first silver coin at the christening. Place the coin in his hand before the ceremony begins and you will ensure a prosperous life for him. One longstanding Irish christening tradition for baby girls is for the mother to give her claddagh ring to her daughter to use as a wedding band with the saying, "With these hands I give you my heart and I crown it with my love." There is no traditional age when the ring is to be handed down, so its up to you to decide when your daughter is ready. Needless to say, a newborn baby may not be ready to appreciate the significance of such a gesture. Neveretheless, you may choose to do it then anyway, to make the day more meaningful. Or perhaps you may prefer to wait until she is a teenager. But giving the gift of the Claddagh anytime in your daughter's life is a wonderful way to honor your child's Irish heritage.